Most Dallas area homes have at least one poorly utilized room. If that home is in the suburbs and lesss than 20 years old there is a good chance that room is a home theater. We talk to many clients each week that have a theater they either aren't using, or aren't using to it's fullest potential. Home theaters were very popular with builders in the early 2000s, partially because they are cheap to build. Most theaters didn't expand the footprint of the house, but allowed the builder to sell more square feet without incurring a huge additional cost. Additionally, homeowners in the suburbs like Frisco, and Southlake wanted theaters at the time, so it was a win-win for the builders. Below you will find a few ideas for how you can update that outdated or rarely used home theater, and turn it into a gathering and entertaining space your family will love. In the outdated home theater, there is a very good chance that the lighting installed by the builder is....underwhelming at best. Adding dimmers will greatly increase the functionality of the room. Smart home lighting systems such as Lutron Caseta, Savant, and Control4 allow you easily substitute existing “dumb” switches for smart dimmers in just a few minutes. Adding dimmable lamps to the room can also add functionality. Having directional lamps near seating areas can allow one member of the family to read, while others enjoy theater style lighting. Having light near the screen wall can add ambient light for social interaction within a space, without adding glare to the screen. This makes the room enjoyable for more than just a “movie and popcorn” experience. If you do install a home automation controller like ELAN, Savant or Control4 you can control the lighting automatically as you control the theater. For example, pausing a movie could cause the lights to get brighter, and starting a movie could cause them to dim back down. In the same way, lights could stay brighter for TV, but dim more when watching Apple TV, Roku, Amazon Fire or the Blu-Ray player. All of this can be done from your favorite theater chair, with only the remote in your hand. This seems pretty obvious, but it is worth saying. The seating in your theater needs to fit how you and your family use your theater. Don't sit and watch movies for hours at a time? Maybe it is time to sell those dedicated theater seats and look for a sectional. Wish you could host the big game for all of your friends? Maybe look into bar seating, a sofa and some occasional chairs along the edges of the theater. If your seating now is uncomfortable, maybe some CinemaTech theater chairs are just what the doctor ordered. There are rules for what makes good theater seating, but they are focused on the ideal viewing and listening experience. If your goal is to have gathering space (or entertaining space, or private space, etc) make sure your space fits your goals. Many of the home theaters we see have dark walls, dim lighting and movie posters for decoration. While there certainly are rules to follow regarding seating location and viewing angles, you can make your theater look however you want. What makes you feel warm and cozy? Is it being surrounded by books? Then surround yourself with books. A big plush rug? Throw a big plush rug on the ground! Many of those soft materials and inconsistent shapes (like bookshelves loaded with books) actually can help make the space sound better, especially when put in the correct places. 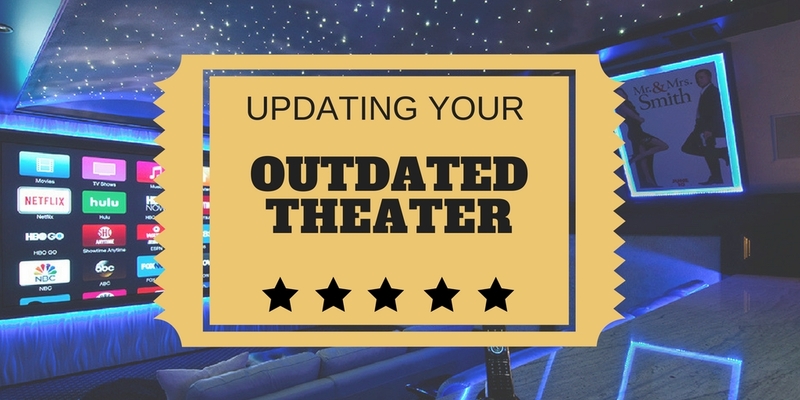 While we won't go into detail regarding where to put your new decoration it is important to realize that your theater is YOUR space. Make it work for you and your family. Not surprisingly, much has changed in home theater technology, and that home theater from 2003 might be due for some updates. We see these nice, but dated, theaters all the time in suburbs like Southlake, Flower Mound, Plano, McKinney, Frisco, and Westlake. The good news is that plenty of your equipment is probably still in great shape, and likely doesn't need to be replaced. Speakers, subwoofers, projection screens and furniture may all be perfectly fine to reuse. Unfortunately, the same is probably not true for your electronics. Like smartphones and computers, theater technology changes rapidly. If your projector (or TV) and surround receiver both have HDMI they may be worth using, if not, it is time to replace them. Epson and Sony both make fantastic projectors at a huge range of prices. Companies like Sony, Marantz and AudioControl make surround receivers at a similarly significant range of prices. If you are looking to turn your home theater into that Movie Theater experience, you will want to consider some more significant upgrades. 4K projectors are now available at very competitive price points, and viewing a 4K image on a 120” screen is simply stunning. On the audio side, Dolby Atmos can help create a truly enveloping experience, with sound seeming to come from every inch of the room. By installing the right 4K projector & screen with a Dolby Atmos system we can create a private cinema experience that will have you wondering why people would ever pay to sit in a traditional movie theater. Adding a smart home automation system like ELAN or Savant can make all of that “complicated” equipment incredibly easy to control. One-touch control of the entire room is one of the biggest home theater upgrades that you can make. If all of that sounds confusing, feel free to call us to setup a free consultation to see how we can help. From a simple update to a mind-blowing upgrade we can create your dream home theater, right in your Dallas/Fort Worth home. If you want to know more about sources for your theater such as Apple TV and Roku, click here for our article on smart streaming devices.